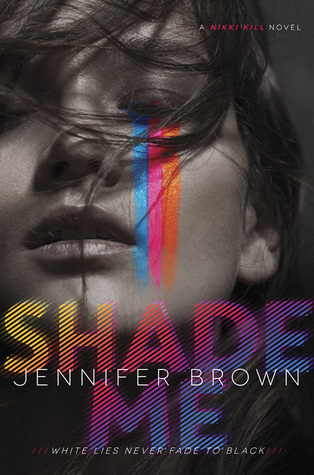 Shade Me was quite different from the type of story I’d normally expect from Jennifer Brown. It frankly wasn’t as heartbreaking or feels inducing as most of her other stories. It had a paranormal element to it. It was a mystery/thriller. I don’t think any of these things had a major impact on how I viewed the novel though. It was pretty clear from the start that this was going to be a different style from Brown. Shade Me stretched synesthesia a fair bit from what the condition is normally associated with, pushing it further into paranormal territory rather than something that can be explained with science. Basically, the main character Nikki sees letters and numbers as different colours; which is something that I've actually seen people have. However, in Shade Me, the character can also feel/see certain emotions in the room as different colours. For example, when someone feels lust she sees purple. While it got a bit unbelievable at times, on the whole this was a very thrilling tale full of suspense and mystery. The mystery was definitely quite intriguing, with many layers to the initial superficial plot. I was never quite sure where the story was going to go, with its weird, sometimes almost unbelievable twists. I have to admit, the villain was fairly obvious even when the author tried to leave tracks in the other direction and one of the biggest twists was made ridiculously obvious by a ridiculously conspicuous (and what the author probably thought was a subtle) "hint". The main character Nikki was quite headstrong, at times foolishly so, and it did kind of get to a point where she was putting herself into situations that were clearly way too dangerous for a high school student. At the same time, the story probably wouldn't have been as interesting without the dangerous situations so I guess I can't complain too much. I don't feel like I particularly liked any of the other characters, and to be honest, didn't feel much of a connection with Nikki either, which is why this book drops a star. To be fair, the book is much more of a plot focused novel anyway. Overall, Shade Me was quite a fast-paced mystery/thriller that had a great layered plot and an interesting paranormal twist. It’s a book I’d recommend to people looking for a quick read.